Modern political economies are strongly skewed towards the interests of older people. 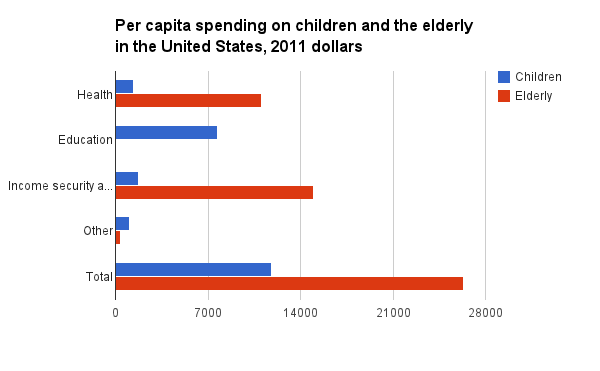 In the United states, per capita spending on the old via pensions or medicare stood at $26’000, while spending on the young via child benefits or other programs was at less than $12’000 (data for the graph below from here). Pensions in particular represent a bigger share of public budgets than any other social scheme, and a large share of health spending goes to care for the elderly. In 2013, the UK spent 139 billion GBP in pensions, compared to 5.9 billion on unemployment, 18.8 on family and children and 37.8 on education. This distribution is even clearer in the case of the US, where pensions and health federal expenditure – more largely targeted at the elderly though Medicare – represented 52% of the federal budget as compared to 16% for education an 8% for other welfare expenditures. At the same time, the United States do not have statutory paid maternity leave. The high level of spending on the elderly is of course justified because elderly people need more state support in bad health and old age, and pensions are more expensive than other other schemes because they are meant to be the main source of income of people rather than an ancillary benefit. Many social security schemes were established at a time when poverty was a very salient risk in old age, and when lower female participation in the labour market did not require subsidised childcare or other schemes that young families now require. After the 1970s and the end of the period of high growth that followed WWII, when tighter fiscal constraints on state budgets kicked in, the door steadily closed for the development of new schemes to accompany labour market changes: the welfare state hasn’t been retrenched, but its ability to cover new risks has declined. This is what Hacker calls the policy drift. However, notwithstanding popular images about poor elderly people inherited from previous decades, a large part of this spending now goes to categories of the population that are significantly better off than the average, for instance, in Britain, in the form of fuel allowances distributed indiscriminately of income or wealth. This would not be less of a problem if the prospects of the young across generations were similar, but the young of today may never reach the level of prosperity and comfort of the current elderly who started their career during the period of strong growth that followed WWII. Many people worry that the benefits of our current elderly will ultimately undermine those of our future elderly, as the commitments made during the period of very high growth of the trente glorieuses won’t be sustainable in the long term, with much lower growth rates and productivity growth than before. In Southern Europe, young generations face extremely high levels of unemployment while they are paradoxically much better qualified than their parents. Many companies implement a “last in, first out” policy when it comes to dismissals, which means that young people are systematically disadvantaged in the labour market, leading to much higher unemployment rates. When we talk about the risks of a lost generation who can’t get onto the job ladder, it’s partly because the previous generation kicked the ladder away. 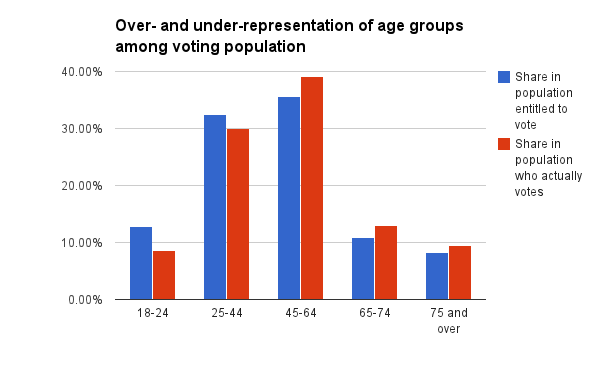 The main reason behind this is that young and older people display strikingly different patterns of electoral behaviour: old people usually vote, while young people don’t. 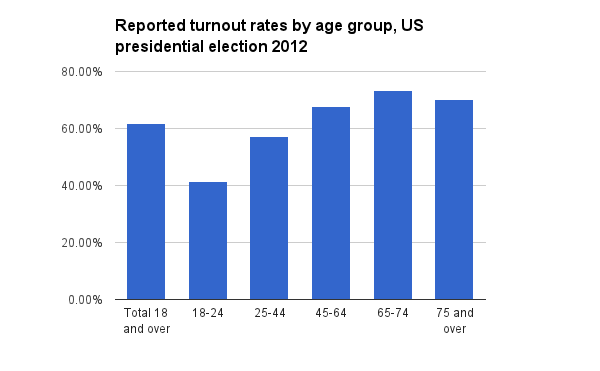 The graphs above (data from the US census bureau) show reported voting rates for the 2012 US presidential election, as well as the share of different age groups both in the overall population entitled to vote (which excludes non-citizens, who also tend to be younger) and the population that actually votes. First, voting rates markedly increase among older citizens: reporting voting rates are about 40% for the 18-24, where they are at 73.5 for the 65-75, and decline somewhat afterwards. We need to note that the turnout a presidential elections is higher than for other elections, especially at midterms. The lower the turnout, the more it is usually biased in favour of the old. The result of these differences is that older age groups are overrepresented among voters as compared to the overall population entitled to vote, with fairly clear incentives for politicians to be especially attentive to their preferences. Hence, people between 45 and 74 represented 46% of the overall population entitled to vote in 2012, but 52% of the population who actually voted. Since life expectancy is around 78 years, it is theoretically possible to win a majority exclusively with votes from people in the second part of their lives, who are already well inserted in the labour market, have completed their education, and who don’t need childcare or maternity leave anymore, while it is not possible to win a majority only with younger people in the first half, who may need these things. The median voter, the one that politicians need to convince to win – majoritarian – elections, has become increasingly older, and she is likely to become ever older in the future. As a consequence, politicians on the right and left engage in a rat race to court the grey vote and please the elderly: defending pensions is much more likely to win votes than childcare or education because those who benefit from the latter are much more likely to cast a ballot than those who benefit from the former. For instance, the British government has been able to implement a cap on benefits affecting mostly young people (jobseekers allowance, child benefits) almost at leisure, while it has ring-fenced pension benefits in spite of the fact that cuts in pensions would allow much more substantial savings in government budgets. In contrast, spending for child care has stayed in a stalemate. With ever lower levels of turnout among the young – partly underpinned by worse economic conditions than their parents – and an aging population, this skew is likely to become bigger and bigger. Ultimately, we may come to a society where the large majority of voters are old and don’t work, while those work and fund public spending don’t vote. The drive towards tighter immigration controls in many countries is also partly underpinned by the preferences of the elderly, for whom immigration is much more of a concern than for young people who have grown up in more multicultural settings. Incidentally, UKIP voters are also strongly overrepresented among older generations. What older UKIP voters are saying concretely is that we should fund their pensions but limit immigration levels which could fund ours. A democracy that is biased towards people in the late stages of their lives is problematic because it is more backward-looking than forward-looking, that is, more interested in defending its acquired rights than anticipating a future that they will not live. Why should a 70-year-old care about the depletion of energy resources in 50 years time? Of course this is a somewhat caricatural way of presenting things, and each generation does not always vote with selfish motives. People may care about their children or grandchildren or simply young generations in general. But then, why do we observe the biases in spending outlined above? In Switzerland, only men were entitled to vote until 1971, and a statutory paid maternity leave was only put in place in 2005. Why did Swiss men not advocate the interests of their wives, daughters or sisters before? Because when choices have to be made with scarce resources, selfish motives tend to prevail. This also does not mean that older people are selfish, but politicians tend to project certain preferences on them in order to win votes. Hence, we need to reconfigure the incentives for politicians. There are different ways to solve the political bias towards the elderly. One is to introduce compulsory voting to compensate for the turnout deficit of the young, or to lower the voting age to tip the balance a little bakwards. Some people also advocate demeny voting, whereby parents can cast votes on behalf of their children. However, with population ageing and declining fertility rates, this is unlikely to solve the problem as the number of elderly voters will expand at a much higher rate than the number of children and young voters. Another proposed solution is the introduction of a maximum voting age, but depriving people of votes altogether is questionable. What we need is a substantial top-up in the weight of young citizens in the political process. There is a case for tipping the balance towards the young on a permanent basis not only for pragmatic but also for normative reasons: young and old face different incentives regarding the interests of the other group even if both are selfish. Young people need to consider the interests and policies for the old because they will be old one day. In contrast, the old will unfortunately never be young again, and therefore only need to care about themselves. For instance, members of the current British government who have introduced 9k university fees and hardened access to benefits for young people have studied themselves for free, and possibly entered the labour market at a time when unpaid internships weren’t the necessary step towards a real job. One radical way to rebalance the political power of generations would be to weight the number of votes according to the average number of years a citizen will have to live with a particular political choice. For instance, a citizen who votes at an election when he is 18 will have to deal with the consequences for 62 years, if one considers that life expectancy is about 80. By contrast somebody who is 70 will on average only deal with the consequences for 10 years. We could for instance weight the number of votes according to this criteria. In order to avoid some citizens having 60 times more political power than others, we could take the rounded square root of their expected life expectancy to reduce this imbalance to a factor of 1 to 8. People between 18 and 23 would have 8 votes, people between 24 and 37 would have 7 votes, and so on (see graph below). People reaching the average life expectancy and beyond will keep one vote. 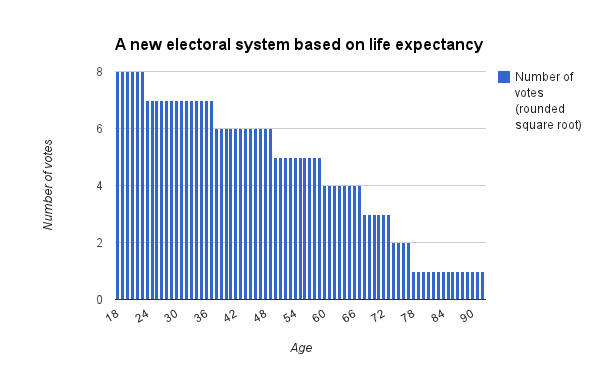 The number of votes could be adapted at each election with the increase in life expectancy. This system would be a departure from the 1 person, 1 vote rule, but many systems actually depart from this rule already. For instance, Wyoming has 0.18% of the US population, while California has 11.91%, yet both have the same number of senators in the US Senate. This means that citizens of Wyoming have 65.7 times more influence than Californians in this house. The system I outline here is actually less unfair, because everybody goes through the whole cycle, and nobody is systematically disadvantaged. People who die young will actually have a higher average influence on average throughout their life than people dying very old: on average, somebody born in an impoverished area of Glasgow, where life expectancy is shorter, will have had more average influence on political decisions than somebody born in Kensington. Such a reform of the electoral system could also have interesting redistributive properties. Empowering young people is also empowering people who are on average less well-off. Of course, the establishment of such a system would require substantial constitutional amendments decided within the current system biased towards the old, and are therefore politically suicidal. In order to restore the power of of the young, what we need are political kamikazes. This entry was posted in Austerity, Modest proposal, Welfare and tagged elderly bias, electoral system, grey vote on June 4, 2014 by alexandre afonso.